La Belle Créole, on the French side of St.Martin, comprises the 25-acre tip of a secluded peninsula. Views are out to sea toward Anguilla and St. Barths or across Marigot Bay to picturesque Marigot and the island's backbone of mountains. La Belle Créole was built of stone to resemble a French fishing village. The hotel is presided over by a pink tower that is visible for many miles. Grounds are beautifully landscaped. Two lovely beaches are for the exclusive use of hotel guests. After passing a guarded gate and traveling up a long, winding drive, guests arrive at a large, festive plaza with fountain. 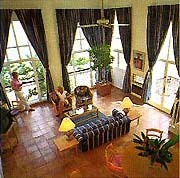 Reception area is within a formal, two-story space cooled by tropical breezes. 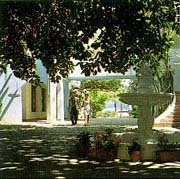 Many suites and rooms are found off cobblestone walkways that connect shaded courtyards, stone terraces and 22 separate buildings. Public spaces are varied, from open and airy to private and intimate. Landscaping is lush and well-tended. For a beautiful aerial photograph (66K) click here or on the picture. 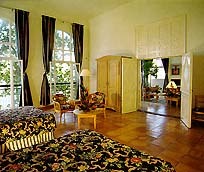 La Belle Créole rooms are unusually large, even by the generous standards of the Caribbean. Within are cool terra cotta floors, wood-beam ceilings, hand-carved wood fixtures, colorful island fabrics, bathrooms fitted with every modern convenience, tropical-style furniture, and watercolors by first-class local artists. 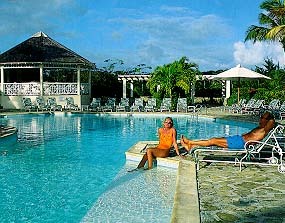 On our grounds you will find a superb swimming pool and jacuzzi served by a tended bar and outdoor cafe. Tennis players will enjoy our four lighted courts, pro shop, and resident pro. Watercraft are available at our water sports facility. A jogging trail winds through the property. Fishing charters and sailing or air charters to nearby Anguilla, Saba, St. Eustatius and/or St.Barts are easily arranged. Guests have privileges on the nearby 18-hole golf course. 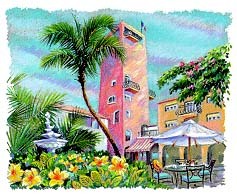 Dining: For dinner, we offer La Provence, one of the island's most elegant restaurants, or the open-air Plaza Cafe with fresh salads and lighter entrees. The Pool Bar and Grill offers a lunch menu. 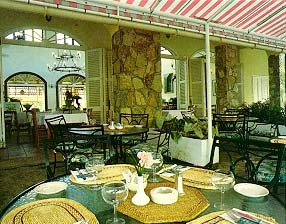 A wide-ranging breakfast buffet is served on the terrace of La Provence. After Dark: Consider a romantic stroll on the beach, a swim in our pool, a night cap in La Belle Creole Bar, or an excursion to one of the island's first-class casinos or nightclubs, arranged for you by the hotel. La Belle Créole brings the pleasures of a French fishing village to a Caribbean paradise. 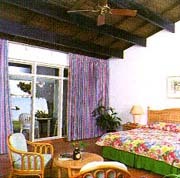 All rooms are impressively spacious, fully equipped, and have either sea or garden views. The Charles de Gaulle suite provides unparalleled luxury in a romantic Caribbean setting. Four all-weather-surface lighted tennis courts are yours. Improve your game with our lessons. Our Watersports Director can put you aboard any watercraft, from sailboard to a sailing charter. La Provence serves formal dinner, while the Plaza Cafe provides more casual fare. Be sure to sample one of our sumptuous dinner buffets of fresh fruit, vegetables, fish, and meats. Patrolled grounds, electronic room safety locks, room smoke alarms and sprinklers, safety deposit boxes. Cribs and high chairs, babysitting available, early arrival and late check-out (if space is available), laundry and drycleaning, luggage storage, manicure and pedicure, massage on premises, message services, gift shop with newspapers, toiletries, souvenirs, car rental office, t-shirt boutique, hairdresser, golf course within minutes from hotel. Above rates are per room, per night, based upon single of double occupancy and are inclusive of our deluxe continental breakfast daily. These rates are subject to 5% municipal tax, and are subject to change.